Recently staff Selection Commission published the notification for the recruitment of Multi Tasking Staff Non Technical in different states and union territories 2014. regional officer of SSC will conducted group C posts of Multi tasking staff MTS NT in different stated and union territories. All those candidates who applied to SSC MTS Exam 2014 now informed that SSC declared the written exam date for multi tasking posts. according to official calendar issued by SSC for the upcoming recruitment in session 2014- 2015 , SSC will held multi tasking staff written examination 16 February 2014 and 23 February 2014 at various examination. however SSC regional office will announce exam date officially on there website but tentative dates of SSC MTS Exam is 16 February 23 February 2014. so guys start your preparation for SSC MTS Written examination because more then 10 lakh candidates will participated in this examination this is one of the largest examination conducted by SSC after SSC CHSL / 10+ 2 level for DEO and LDC posts. Admit card for multi tasking staff recruitment will be hosted online region wise that’s means candidates can only download there MTS NT admit card only from there region. Usually ssc uploads admit card before the 2 to 3 week ago online so its expected that admit card / call letter will be available online from last week of January 2014. after that candidates can download there admit card online via entering there registration no. 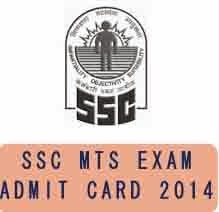 A direct link of admit card will be updated Here Mexam.IN very soon so stay in touch for SSC MTS Admit card 2014 latest news updates.